The first Virgin Atlantic lounge opened at London Gatwick Airport in 1990, to coincide with a newly launched service to Los Angeles and the introduction of onboard beauty therapists. It was located landside and was designed as a replica of the famous bar at Raffles Hotel in Singapore, complete with wicker chairs, plastic palm trees and tropical murals on the wall. 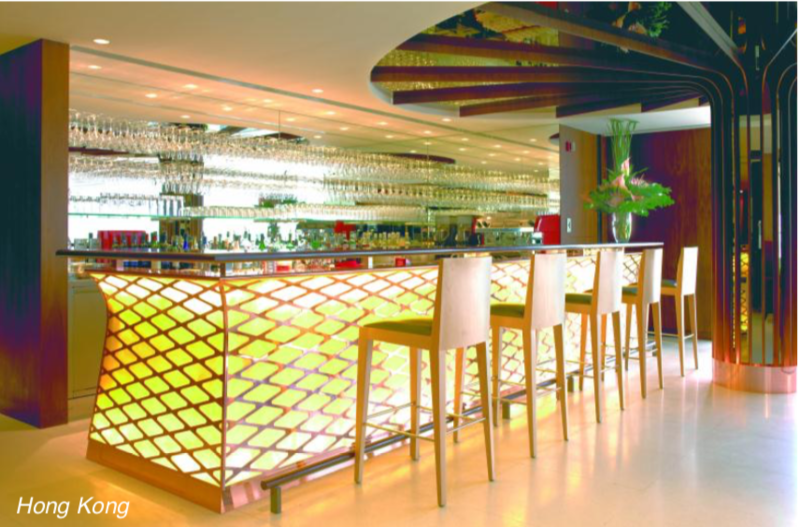 It sounds cheesy and the design now looks very dated, but back then it was an absolute revolution – a huge leap in lounge design that really set the standard which lives to this day in Virgin’s newest Clubhouses. In 1990 no other airline provided food in their lounges; they were mostly musty old rooms with leather Chesterfield chairs and a hushed environment, with the only sound being fax machines whirring (this was before email was widely used.) Even today most other airline lounges only offer self-service food. Virgin Atlantic’s Gatwick lounge not only offered great food and drink; it was all silver service! The people who worked there talk of it being like a British stately home, as once the flight had departed, they had to stay and polish the silverware. Back then most of the airline’s fleet couldn’t land in the fog and were much less reliable than they are now. There were lots of delays and people rushing off to places like Cardiff to handle diversions every misty morning. This was also the day of handwritten tickets when Virgin flew to Newark from Gatwick and had 78 Upper Class seats on an old 747 Classic and each Upper Class passenger was given a free economy ticket. 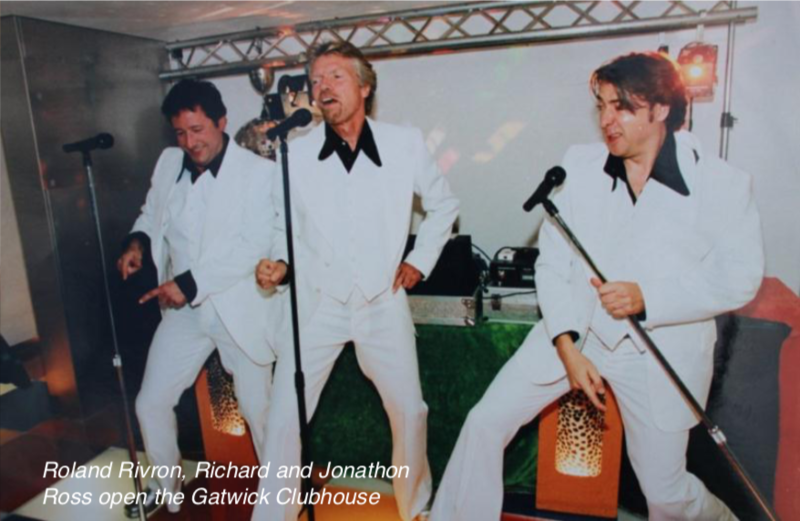 It was also the heyday of Virgin Records, and celebrities were regular customers to the lounge and Richard Branson was in there every week. 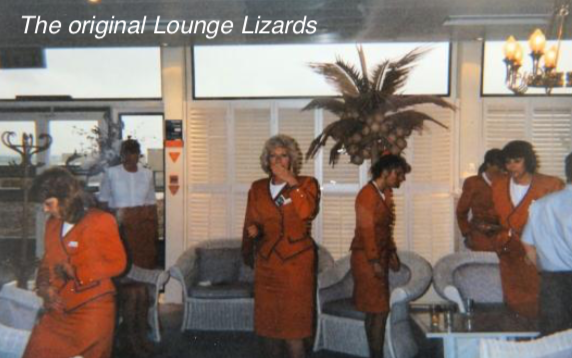 There are great stories from the era when the lounge lizards (as the people who worked there called themselves) used to entertain guests with dancing competitions during long delays. One was famously won by Womack and Womack! The lounge had a real ‘club’ atmosphere and it grew a reputation for being fun, different and better. It’s hard to believe that by 1991 Virgin was flying from Gatwick to Newark, JFK, Boston, Miami, Los Angeles and Narita. Then came the big move into Heathrow. Virgin Atlantic’s first lounge at Heathrow was a curtained off area at Gate 55 while work got underway on the new flagship lounge. Here Virgin employed its first ground-based beauty therapists, branded ‘Body and Soul’ who supported the inflight beauty team. 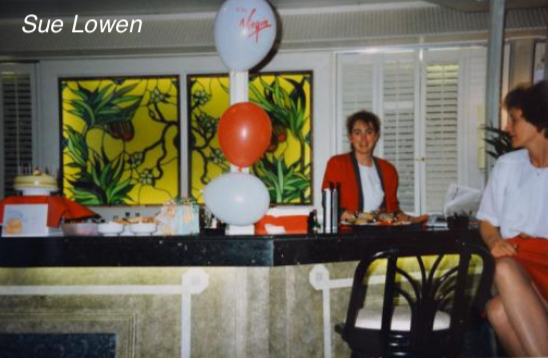 1993 was another massive year in Virgin’s history, when it began flying to Hong Kong and San Francisco, celebrated its 10th birthday, introduced a premium economy class, and opened its first branded Clubhouse at Heathrow on Monday 22 February 1993. It was another revolution, a massive space (the idea was that Virgin would grow into it) and featured myriad innovative and wacky features including a huge toy train set that delivered snacks all round the lounge, and a music room with soundproof walls that housed the very best audio equipment. At one point there was even a Dalek from TV series Dr Who to greet passengers as they entered. The latest games were available, including ski simulators and a mini golf course. Upstairs was a dome conservatory lounge, which later had access to an outside area with a garden. Another first. 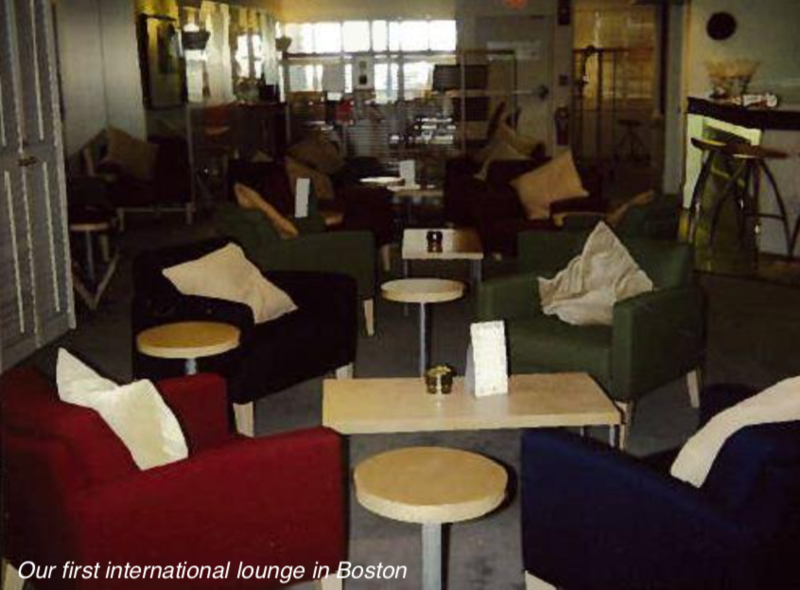 At the same time as the big Heathrow Clubhouse was being showcased, over in Boston Virgin opened its first lounge outside the UK, a much smaller lounge, but one that was to pave the way for delighting Upper Class customers on shorter routes. Two years later and the first JFK Clubhouse opens in New York. A very low-key affair, and quite plain by today’s standards, but a significant step on what was to become the airline’s busiest international business route. 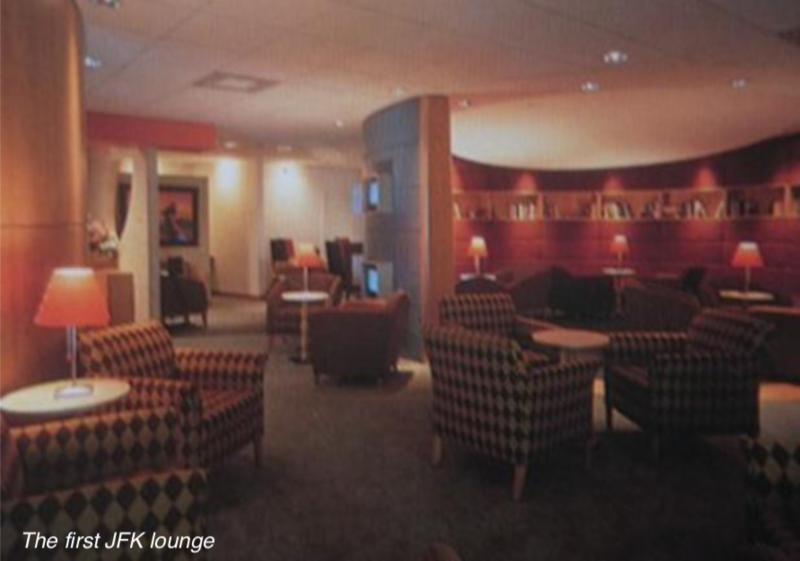 The first Newark Clubhouse opened in 1996 and in the same year Virgin opened a lounge in Johannesburg, South Africa. 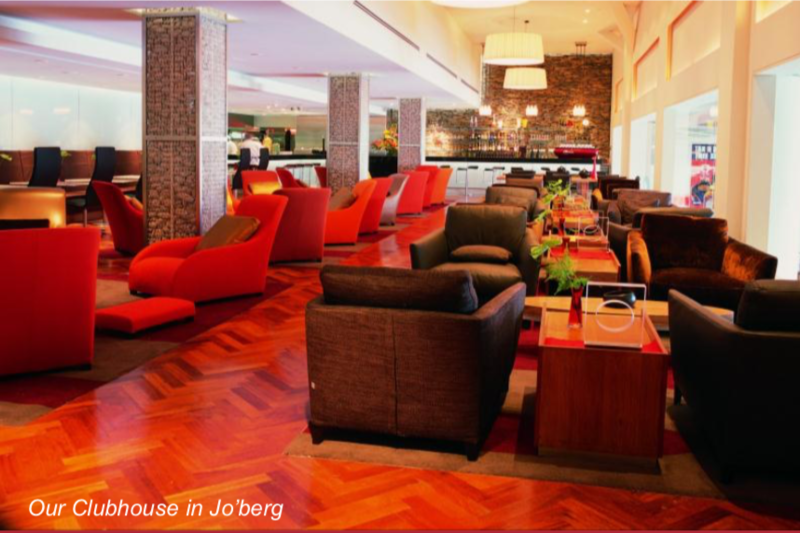 The focal point of the Jo’burg Clubhouse is a beautiful open kitchen and bar area where passengers can sit and watch their meals being prepared. Passengers can sip on cocktails whilst chatting to the friendly chefs. It allows colleagues and passengers the opportunity to interact and is always a great talking point. 1997 and the ‘Virgin Touch’ spa brand had become famous throughout the world, with passengers being able to enjoy treatments in the air and on the ground. 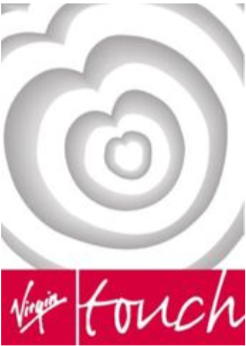 The familiar ‘heart’ logo could also be found in Virgin Atlantic’s newly opened office in Crawley, just by London Gatwick Airport. 1998 was a bumper year for opening new Clubhouses. First up was the new Gatwick Clubhouse, which opened in its new airside location with sweeping views of the airport. 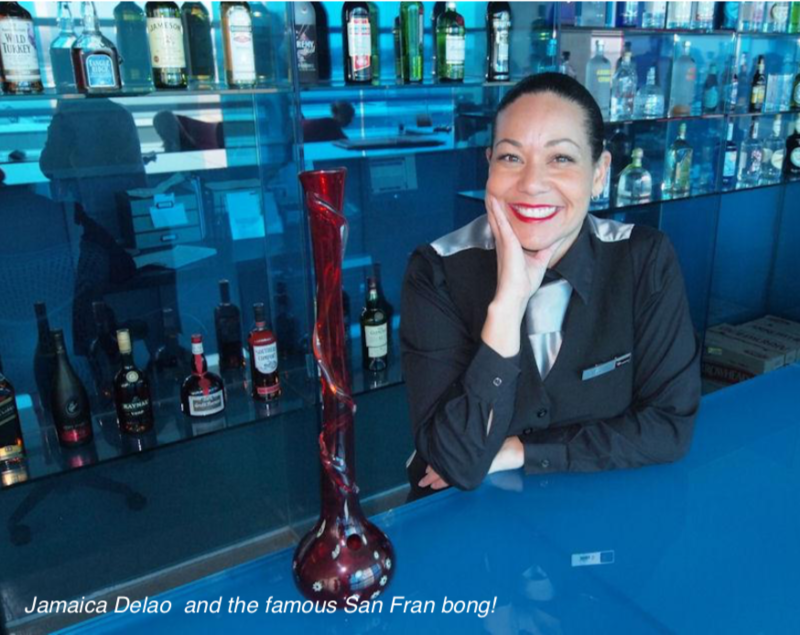 This was also an exciting year in Hong Kong as Virgin moved into the new Chek Lap Kok airport and opened a modest Clubhouse, something that was to grow in years to come. The movers and shakers of Washington were next up as the fourth US Clubhouse opened. Situated on the mezzanine level at Dulles, Upper Class guests could enjoy great views of the airport and get to spend more time there as it is right next to the gate. 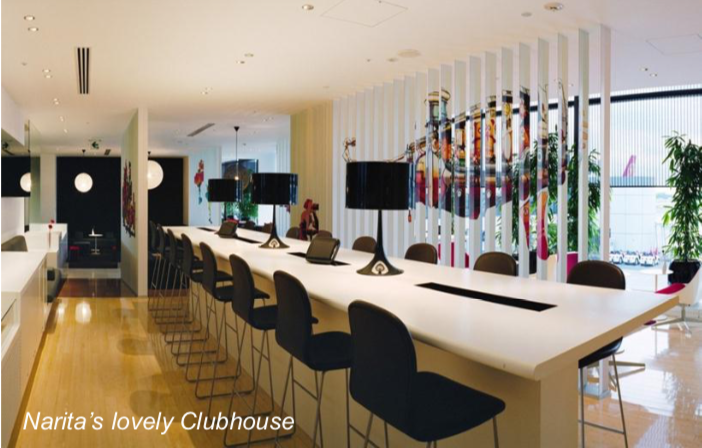 1999 saw the first iteration of the Tokyo Clubhouse open and an upgrade to the Newark Clubhouse. In 2000 ‘Revivals’ opened at Heathrow for arriving passengers to freshen up and have a bit of breakfast when they land. This included the innovative ‘double-door wardrobe’ feature in the showers, where a customer’s clothes were pressed while they showered. On west coast USA, San Francisco also opened a Clubhouse. Serving silicon valley and Hollywood, the San Fran Clubhouse is a striking blue colour with great views. Anyone visiting the Clubhouse may notice an unusual item on the shelf behind the bar… a red bong! This was Richard Branson’s idea… he wanted something that represented California. In 2004 the Hong Kong Clubhouse moved into its new location ahead of operations to Australia. In the USA there was mixed news. In JFK the really famous landside Clubhouse opened, one of the most distinctive and iconic designs and a great favourite with everyone. However, in Boston a terminal switch meant that for a short while Virgin had to once again share lounges, this time with Northwest and later Aer Lingus. From 2004 there was a quiet period in Clubhouse development, with only the Tokyo lounge getting refreshed in 2007. 2004 also saw services to Sydney begin, and a bigger lounge in Hong Kong. 2005 saw the first phase of the new flagship Heathrow Clubhouse opening (it was developed in two phases which were joined together in 2006). 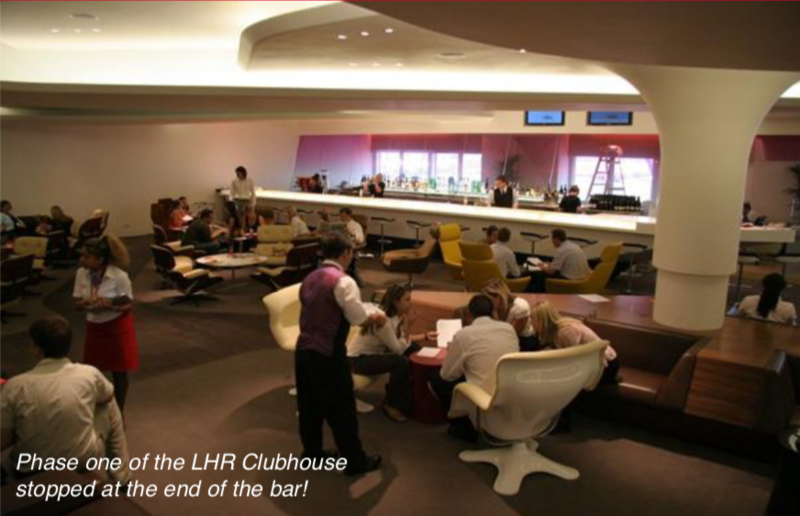 Phase one saw Virgin say goodbye to the original Heathrow lounge and with it many memories. The long table (now in the business area) was one of the few things that made the transition from old to new. This historic table came from the Manor in Oxfordshire where Richard ran his record label and has huge sentimental value for the boss. 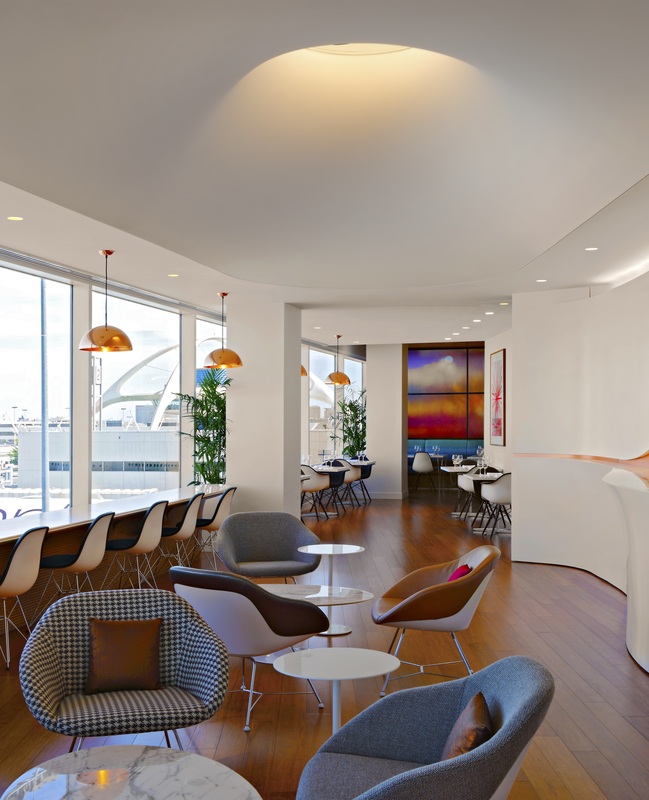 The new lounge also marked a pivital point for Virgin Touch, which was re-branded as Clubhouse Spas, introducing a new partnership with Cowshed and Bumble & Bumble. The current full-size Heathrow Clubhouse opened on 23 March 2006 and has wowed customers and won awards since it opened. Features include a poolside lounge, concierge service, deli, brasserie, cocktail bar, Grey Goose lounge, den, cinema, library, roof garden and spa. This took the whole concept of the airline lounge to a level that hasn’t been beaten in nearly seven years. 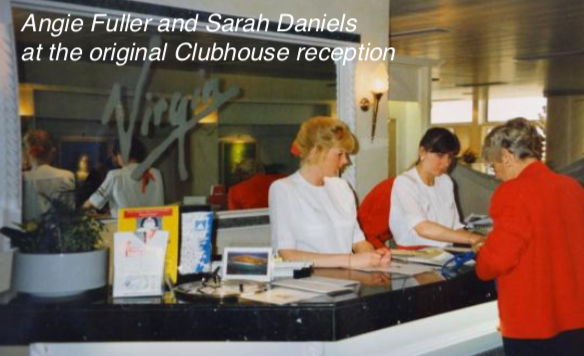 There have been hundreds of stories from the Clubhouse in the last 6 ½ years, but perhaps the relationships that Virgin staff have forged with guests are the most telling about the service in the Clubhouse. “Many guests have gone from being customers to becoming personal friends of some of the team in the Clubhouse, and despite the fact that we see 250,000 people a year, there is a large percentage who are very familiar to us,” adds Thomas. The most common compliment is about the team in the Clubhouse and the great service that they give. This teamwork runs deeper than just working together, but there are also events outside the workplace that Clubhouse staff get involved with. For example, for the last two years the staff have been taking part in a 10k run as a team, raising money for charities that mean something to the team. Last year, Clubhouse staff ran for the Virgin Atlantic charity, which was important to several members of the team who have taken part in events to support people in Japan, Kenya and India. In 2008 Boston rejoined the Clubhouse gang. This took the deli concept which worked so well at Heathrow and used it as a model for the much smaller Boston lounge. 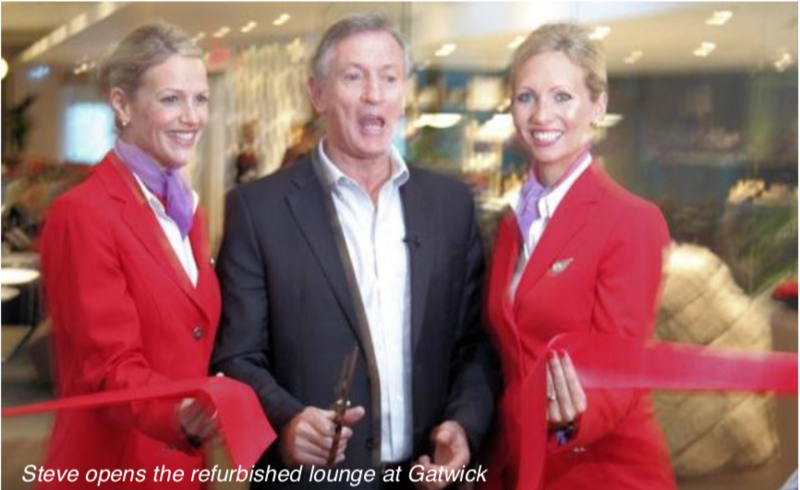 Gatwick was next up for a refresh in 2009 with the lounge having a new set of features including a games room and new spa. 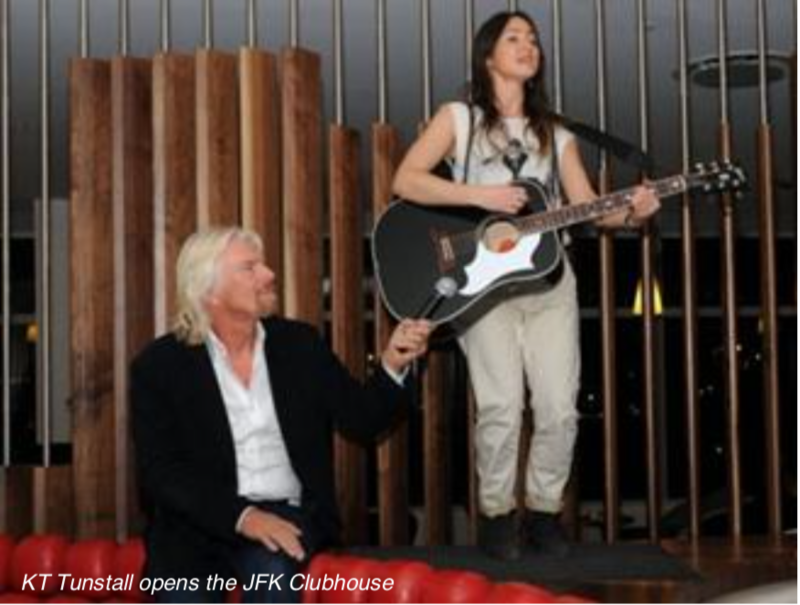 March 2012 saw Virgin unveil its revamped JFK Clubhouse, a US$7 million airside space designed by Slade Architecture in collaboration with Virgin Atlantic’s in-house design team. At 10,000 square feet, it is more than double the space of the previous design. The space is inspired by the theme ‘Understatedly Uptown, Unmistakably New York’, and aims to offer passengers different zones in which to work, relax, or have fun. The wide windows on both sides of the Clubhouse create a focal point, with views of Virgin Atlantic aircraft at their gates, and a glimpse of the landmark Saarinen designed former TWA Flight Centre, one of the world’s greatest examples of airport architecture. with a backlit bar, ebony end grain wood flooring, quirky Nube Italian leather studded Sir chairs and Arne Jacobson designed Swan chairs, to create the aura of a private members club. The Entertainment Zone features a maple wood and burgundy billiards table, and one of the main features of the new Clubhouse, an oversized, custom made, flame-red ball sofa that is designed to encourage a social aspect. Just off Central Park is an intimate sunken area known as The Snug with bespoke banquette seating, while at the far side of the lounge is The Den, with unique furnishings designed to offer a more relaxing atmosphere. There is also a Talking Lounge, complete with VIP area and large windows offering glimpses of the Saarinen terminal, a brasserie designed for passengers preferring a formal dining experience, and a carpeted Quiet Lounge. JFK also boasts the first Clubhouse Spa outside of London, featuring New York City-based salon and product company Bumble and Bumble’s first US airport salon. The spa features the same alabaster terrazzo flooring as the reception, and as with the London Clubhouses, all salon fittings have been provided by Takara Belmont. 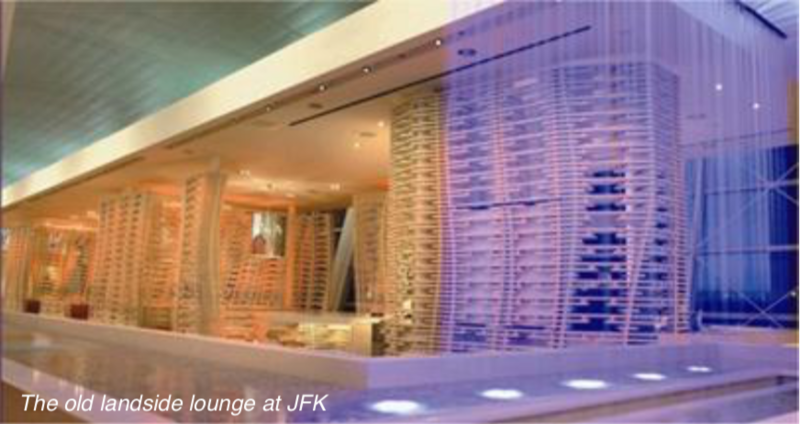 Fast-forward to December 2012, and Virgin Atlantic completed its £100 million revamp of the Upper Class offering with the opening of a brand-new Clubhouse at New York’s Newark Liberty International Airport. Again created by Slade Architecture in collaboration with Virgin Atlantic, the Newark space has been designed with ‘a mixture of NYC’s downtown flair and Virgin Atlantic’s warmth and individuality’. The lounge is intended to echo lower Manhattan with its Soho boutiques, TriBeCa lofts, Noho coffee shops, secret bars in the LES, and Meatpacking District chic. To allow passengers the maximum time for relaxation before boarding, the 5,000 sq ft Clubhouse is now located airside, after the security checks in Terminal B and close to the gates. 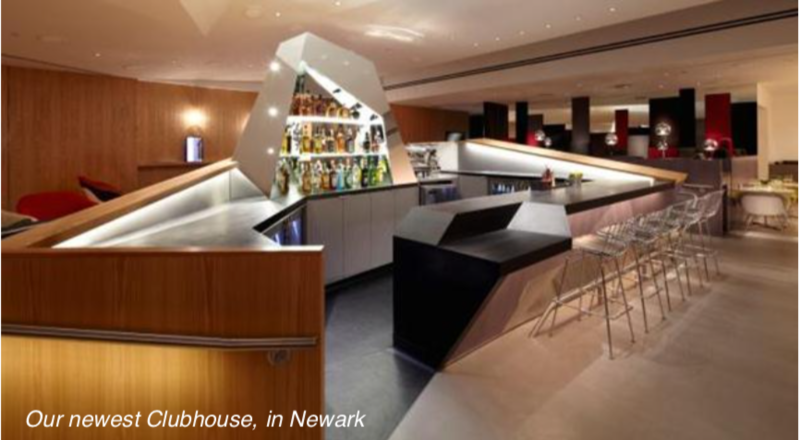 The Newark Clubhouse features the Liquid Lounge, a central cocktail bar with crystal features refracting natural light, as well as a Passion Pit sunken lounge area, an Origami Lounge for passengers looking for more privacy, a brasserie, and a ‘screening room’ which features films from graduate film makers from the National Film and Television school. Certainly a far cry from the 1990 lounge with its cane furniture, but if only they could bring back the Daleks! 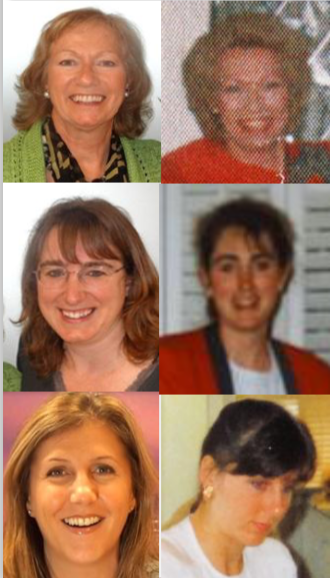 Many thanks to the global Virgin Atlantic Clubhouse managers for their contributions, especially to Julie King, Sue Lowen and Sarah Daniels – three of the original Gatwick ‘Lounge Lizards’ for sharing their amazing stories and photographs.